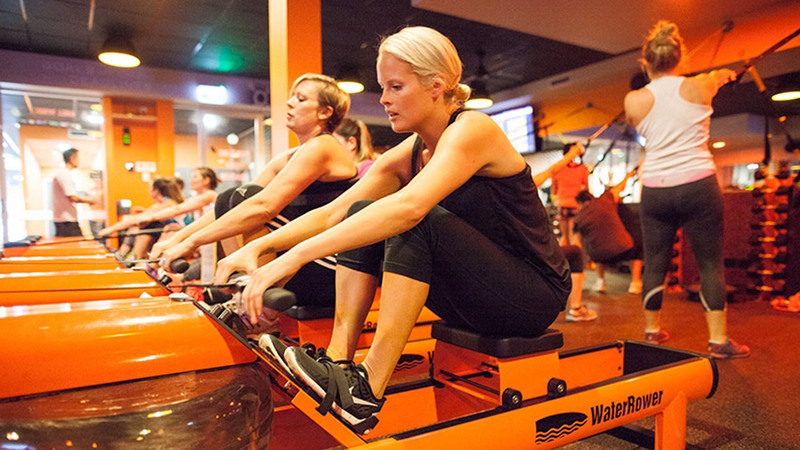 Discover Orangetheory Fitness, an extensive workout that will push you to your limits. Last week I put my body – and heart rate – on the line as I road tested the latest fitness craze to hit our shores: the intriguingly named Orangetheory Fitness. A one-hour class that mixes up interval-based cardio with sequences of circuit training, it was refreshingly difficult and – oddly enough – rather entertaining. The premise of Orangetheory Fitness is simple: in the same spirit as personal training, you switch between various gym equipment under the guidance of a roaming instructor, as well as tracking your own progress via the heart rate monitor display in the room. It’s all about understanding why you’re training the way you are, and building up an awareness of how your body works. Before the class kicked off, I had a heart rate monitor strapped across my chest to show my resting heart rate up on a large screen. Walking into the classroom, my heart rate monitor began to show an increase as I surveyed the space. Lit with neon orange lights, a row of treadmills faces the mirror, backed by a row of water-based rowing machines, backed again by around 15 workout stations equipped with hand weights, ropes, pulleys, and ab machines. Serious business. My heart rate was entering the orange zone and we hadn’t even begun working out yet. So, like all new things, the first step was just to get started. The music began to blast and our instructor Darryl split us into two groups – the first was to swap between the treadmill and the rowers, the second was to start on the circuit training. We completed 30 minutes on each side, then collapsed for stretches. It was a high-intensity hour, with your attention constantly shifting between following the set sequences and keeping an eye on your heart rate ‘zone’ on the large LED screen in the corner. As the class began to heat up, the odd name of ‘Orangetheory’ started to make sense. Apparently, we have three states of ‘being’ during exercise: grey, being resting or relaxed; green, being stimulated yet comfortable; and orange, being a challenging level where our heart rate is high and our bodies are feeling the burn. The key to a good workout session is therefore achieving a least 12-18 minutes per hour of ‘orange level’ exercise. This will ensure your body will continue in its post-oxygen consumption up to 36 hours after the class. Fitness trends generally have a reputation for being all bark and no bite, but unlike other fads, Orangetheory Fitness has got teeth. Fast, hard, and grounded in scientific studies, Orangetheory has a loyal following in America with 88 franchises already established, and another 175 set to open in 2015. In Australia, there are currently 3 studios (Brisbane, Sydney, and Adelaide), with more cropping up internationally in Canada, Colombia, Mexico, and the UK. With more Orangetheory gym franchises opening up month to month, they are definitely doing something right. I work out regularly: I run 3-4 times a week, and attend 1 or 2 classes at the gym. So, by all accounts, I consider myself a pretty fit person. One hour of Orangetheory Fitness, however, and I was reconsidering this position. The combination of cardio interval training, short cycles of weights, and other circuit training means you are burning the candle at both ends in regards to endurance and resistance. And yes, the ‘Orange Effect’ is all truth – you still hurt 36 hours later. If you get bored easily during your workouts, this is the class for you. You’re constantly being stimulated, whether it’s swapping machines, counting your reps, or checking up on your heart rate. It’s like an hour-long game where you walk out exhausted and very, very sweaty. What’s not to like? Ensure you consult with your GP or health professional prior to undertaking a new workout regime.